PJ Schnyder: Phoenix Rising, by Pip Ballantine and Tee Morris, is the first novel introducing the Ministry of Peculiar Occurrences. The Ministry of Peculiar Occurrences has many forgotten tales in the depths of its Archives. 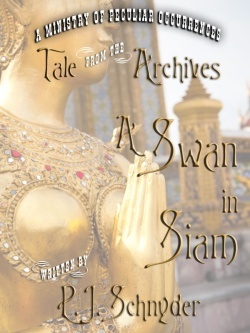 And authors Tee and Pip contacted me, inviting me to contribute to the second volume of their official anthology, Tales from the Archives. They asked me to write a short story, equal parts paranormal and steampunk, within the world of the MoPO. I was flattered and incredibly excited to oblige them. TGE: Your story is set in Siam (currently Thailand). That is awesome. What’s the basic premise? PJS: The year is 1863, dangerous times at the royal court. An agent of the Ministry of Peculiar Occurrences has come to Siam investigating the odd circumstances surrounding the scene of a murder and meets instead, a guardian with very peculiar skills whose presence in the palace is solely dedicated to the protection of the King and his household. 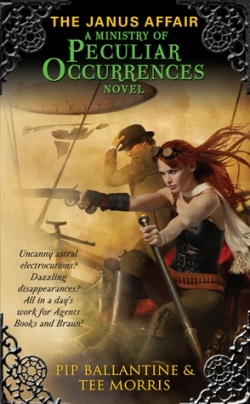 TGE: What kind of steampunk goodness can readers expect from the story? PJS: Lots of gadgets! LOL. Also, an intricate musical device, a glider and plenty of dynamite. TGE: Please introduce us to the hero and heroine. PJS: Phailin ( pronounced PIY-LihN) is our mysterious guardian. She is fiercely loyal and incredibly graceful, not only in dance but also in flight. Agent John Alvey represents the interests of the Ministry of Peculiar Occurrences, a dashing and well-read man, particularly in folktales and mythology. TGE: Tell us about the podcast version of the story. What was it like to tape it? PJS: I’d never recorded audio for a podcast before, but Tee Morris was incredibly encouraging and helpful. I wrote a post here about my adventures. TGE: Where can readers go to listen to the podcast? I highly encourage readers to listen to all of the podcasts of the Tales from the Archives as they are very engaging and produced with high quality. TGE: Where will the anthology be sold? What formats will be available? PJS: The Tales from the Archives Volume Two will be available on Amazon, Nook and Smashwords in ebook formats. The individual stories began releasing on April 10th, 2012. TGE: Is there anything else you’d like to share about your story and/or the anthology? My childhood memories echo with the sound of my mother’s voice, telling me the folk tales and mythology of Thailand. She walked the entire perimeter of the royal palace in Bangkok with me, relating the epic saga of the Ramayana depicted in beautiful murals on the walls protecting the palace grounds. 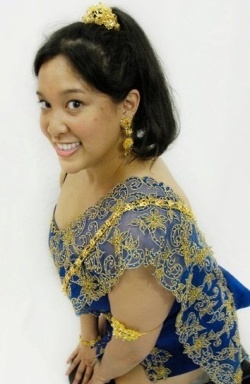 Years later, she taught me to perform a traditional Thai Dance of Manora, the bird princess. Without the PJ Mommy, Phailin would never have come to life. Ms. Schnyder, thanks for your time, and for your art. 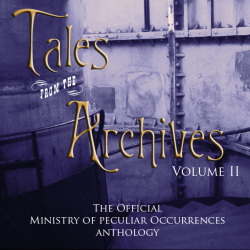 To learn more about the anthology as well as the Ministry of Peculiar Occurrences, click here.